SONIC Drive-in Crew from Knoxville, Tenn. is Honored as the Best in the Nation | Sonic Corp.
OKLAHOMA CITY--(BUSINESS WIRE)--Sep. 13, 2018-- SONIC® Drive-In (NASDAQ: SONC) is celebrating this year’s gold medal winning crew from Knoxville, Tenn. (7519 Mountain Grove Dr.), who was awarded the championship title in SONIC’s annual premier training program, DR PEPPER SONIC GAMES, sponsored by Dr Pepper. As the best drive-in crew in the country, they excelled through a series of intense individual and team trainings and quizzes during a span of nine months. 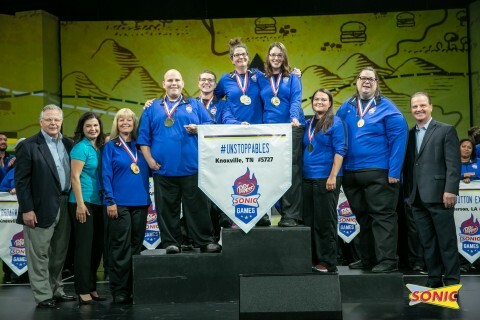 The Knoxville crewmembers competed against 11 other talented drive-ins, and claimed their winning title in front of thousands of SONIC franchisees and executives at the 2018 National Finals Awards Ceremony held during the annual SONIC National Convention in Washington, D.C. on Sept. 12, 2018.